There’s no doubt that Iron Man 2 is one of the most anticipated movies of the year–’tis an oft exaggerated claim, but in this comic book movie case, complete truth. To help you touch up on your Iron Man knowledge beforehand, Zumobi Inc. has just released Iron Man Central, the official app for all things Iron Man. Iron Man Central is great for new and old fans, alike. New fans coming fresh off the movies can explore Tony Stark’s comic book history in the Origin tab, and old fans can keep up with all the breaking news concerning the sequel’s release using the News tab. This section boasts all the latest information about the video game, the movie, the toys, interviews, etc. The Videos section hosts a number of interesting clips, from interviews to behind-the-scene glimpses to commercials and trailers. Fire up the in-app video player and listen to Gwyneth Paltrow or Scarlett Johansson discuss their roles and their time on set. Another tab to check out would be Wallpapers, in which you can find exclusive content to grace the screen of your iPhone or iPod Touch. As of this moment, there are over 10 wallpapers featuring comic book art and movie photography, 2 of which are free: the rest are available for download at $0.99 apiece. Through the Tickets tab, you can book your movie tickets with an in-app browser and Fandango. If you want to share any of the news or videos or wallpapers with friends and family, you can either take advantage of this app’s Twitter and Facebook integration or just use your email by tapping Share (found on the upper right corner of many pages). 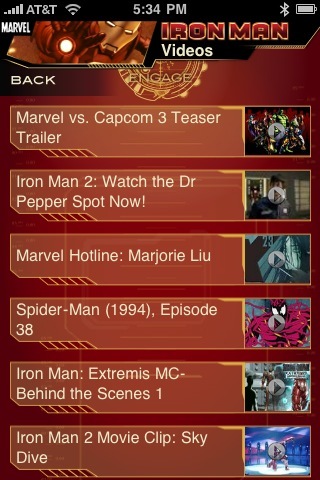 Iron Man Central is not only gorgeous, but hosts a wealth of information that many will find useful. The interface, modeled after the hologram inside Iron Man’s suit, is easy on the eyes and easy to navigate: the buttons are very accessible, and all content is perfectly viewable and seamlessly incorporated. This app requires an internet connection to use, and also contains many links that lead out of the app, which can be quite disrupting; an in-app browser would be nice, but the most useful information can already be found in the app itself, so it’s not a major snag by any means. The best part? Aside from the pretty wallpapers, this app is completely free, so grab it to read while you’re standing in line for the midnight showing. AppSafari review of Iron Man Central was written by Julie Guan on May 9th, 2010 and categorized under App Store, Events, Free, Fun, Local, Movies, News. Page viewed 3766 times, 1 so far today. Need help on using these apps? Please read the Help Page.